Nigerian-born Magnus was one of the success stories of the Diamonds Youth Policy, after initially joining Diamonds under 16’s from Fulham. He graduated to play in League 2 for the Diamonds mostly in a centre-back role. Allocated the squad number 40 for the 2002/2003 season, he did not make his first appearance for Diamonds until the following season when he came on as a second half substitute against Colchester United. Although still playing in the Youth team squad, an injury to Graham Allen at the start of the 2005/2006 season saw him get another chance, and he went on to make 25 appearances before the end of the season. He left the club in May 2006 after contract talks stalled, and initially joined Aldershot Town, before moving to St. Albans City and Crawley Town in January 2007. 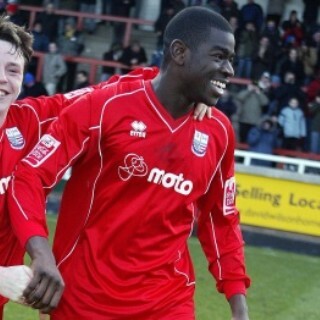 The following season, he joined Dagenham & Redbridge before a brief loan spell with Weymouth. He rejected a three year extension to his contract with the Daggers in May 2009, and agreed a two year deal with League One side Colchester United on 1 July 2009 (ironically, the side he made his debut against for the Diamonds). He quickly became a fans favourite and after a year’s extension to his contract, Magnus signed a further three year deal with the U’s in the summer of 2012. A serious knee injury ended his time with Colchester in 2015, and he struggled to regain fitness during spells at Luton Town in 2016, Dagenham & Redbridge (2016-17) and Maidstone (2017). He signed for Dulwich Hamlet ahead of the 2018-19 season. His Wikipedia page is here.